ADHERE Spray Adjuvant is designed to improve the efficacy of certain active ingredients. Manufactured to an internationally recognised quality system. It is a blend of highly refined mineral oil and non-ionic surfactants. Highly refined mineral oil (USR >92%) reduces the potential for crop phytotoxicity. The mineral oil reduces spray droplet evaporation rate and modifies the waxy cuticle on the target surface enhancing performance of the active ingredient. 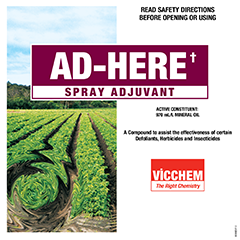 AD-HERE Spray Adjuvant can assist in maximizing the availability and penetration of active ingredients (a.i.) on the surface of the target. This is achieved by several factors. 1. AD-HERE Spray Adjuvant can reduce the evaporation rate of the droplet. By maintaining a larger droplet size the likelihood of the a.i. Drifting off target is minimised. On the target surface, AD-HERE Spray Adjuvant can extend the time that an a.i. Remains in a liquid form. This can increase its availability for penetrating the target. 2. AD-HERE Spray Adjuvant can improve the spreading of the a.i. On the target by lowering the droplets surface tension. The association of the a.i. With the oil may also resist wash off due to rain. 3. AD-HERE Spray Adjuvant can enhance the penetration of an a.i. Into the target by modifying the waxy cuticle on the target’s surface. This can improve the performance of the a.i. Always follow the directions for use on product labels. The active ingredients label has precedence over the adjuvant label. is endorsed for use with DROPP* ULTRA at the rate of 2L/Ha The general use rate with herbicides is 1% v/v of the spray solution for boomspray application Agitation of the spray tank should continue until completion of spraying. AD-HERE Spray Adjuvant is suitable for use with a range of products when mineral oil based adjuvants are specified on their label. 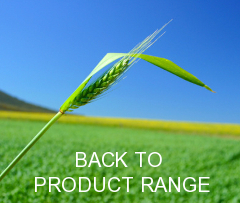 Field Trials conducted with AD-HERE Spray Adjuvant have shown its suitability with a range of products. AD-HERE Spray Adjuvant can be used with products that recommend mineral oil adjuvants. In cases where the active chemical’s label recommends a specific adjuvant it is best to use the products specified. Copyright © 2017 Victorian Chemical Company Pty Ltd. All rights reserved.